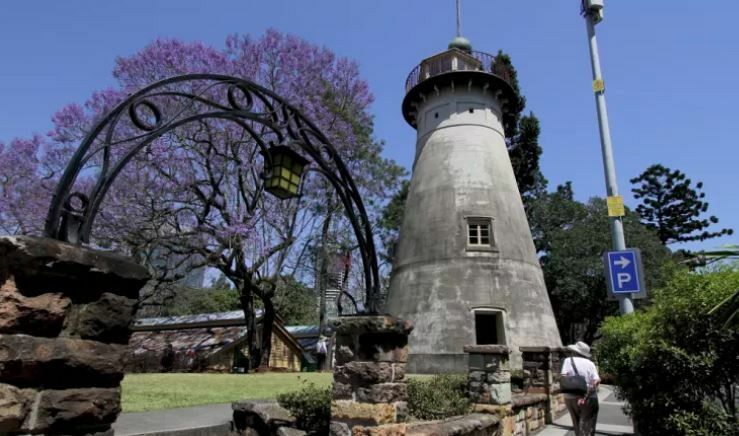 A dark history of hangings and torturous punishments haunts Brisbane's oldest building, a stately stone windmill atop Spring Hill. Opening just once a year as part of Brisbane Open House, many miss the chance to explore The Old Windmill. Built in 1828, it is the oldest of its type in Australia and visitors can see graffiti scrawled on the stone 100 years ago. Now a team of University of Queensland architectural students have recreated the structure in virtual reality. Down to the texture of the stone, senior lecturer Kelly Greenop of UQ's School of Architecture said the details made the work a useful historical tool. “It’s really important that it looks realistic so it’s not only authentic but historically useful,” Dr Greenop said. And exploring the building’s past is a prime feature of the work. Two Indigenous men were reportedly hanged from the tower and a treadmill that powered the windmill was used as a punishment for convicts. The treadmill would have taken more than a dozen people to operate. Students Jay Stocker and Pat Manyuru worked with Dr Greenop to capture the building with 3D scanners, then recreated it as it would have looked in colonial times. “It’s all about heritage and how we can use digital technology to safeguard it for the future and how we can use it to find out more about the past,” Mr Stocker said. “We decided to see how close we could get to how it was actually like in 1840 when it was still functioning,” Mr Stocker said. The area was listed as having high potential for archaeological finds and Mr Stocker said the work done mapping the building could lead to more discoveries. “The treadmill arrangement was different to how we’d imagined it. There were two treadmills side by side with eight places each,” he said. “We can say now if you dig here underneath Wickham Terrace, there’s a good chance you will find remnants of the foundation of the treadmill." Dr Greenop admitted exploring the site digitally was not the same as being there in person, but for tourists with limited time and those unable to tackle the four storeys of steep stairs, it was a way to explore Brisbane’s history. “People can get a good impression and see what it’s really like inside,” she said. The full rendering of the building was to be showcased at Brisbane’s next Open House, on October 13, at Brisbane Square Library.